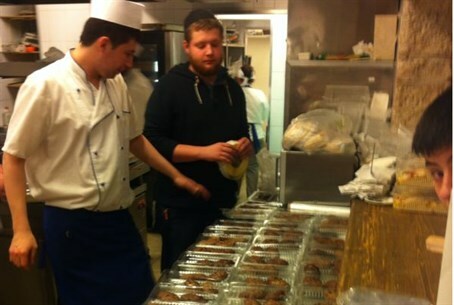 About 100 pilgrims who were stuck in Moscow airport received kosher food thanks to Russia's chief rabbi. About 100 Jews who made a pilgrimage to Rabbi Nachman's tomb in Uman were stuck without food in Moscow's airport on Sunday – but were saved from their plight through the intervention of Russia's chief rabbi. The members of the group arrived in Moscow on Sunday and were supposed to get on connecting flights to Israel and the US. However, these flights were cancelled at the last minute, and the replacement flights were not scheduled to take off until Monday morning. The people, who had been fasting on Sunday because of the Fast of Gedalya, found themselves in Moscow Airport with no kosher food to eat, after already fasting for a day. Making things worse, members of the group who have US citizenship could not cross into Moscow and obtain kosher food there. At this point, Russia's chief rabbi, Rabbi Berel Lazar, intervened. His office succeeded in getting the airport to give extraordinary approval to bring in mehadrin kosher food and drink for members of the group who were stuck in the airport. In the end, food was brought in that should suffice for all 100 members of the group. The meals were prepared at the Marina Roscha Jewish center in Moscow. Rabbi Nachman of Breslov, a great hassidic sage, mystic and storyteller who died 203 years ago, has a deeply devoted stream of followers that grows to this day. His adherents make pilgrimage to his grave every Rosh Hashana, in accordance with his own instructions.